On Tuesday afternoon, a colleague who lives there told me downtown Los Angeles has become the hip place to live. He wasn’t bragging; he was bemoaning. He has to put up with the crowded stores and parking lots — not to mention the even thicker traffic on I-110. Maybe it was coincidence, but that evening as I headed to Little Tokyo for Weller Court, the small, clean shopping center that houses the Blue Whale jazz club, I think I caught a taste of what he was talking about. Orochon, the spicy ramen counter, was overflowing, with a line outside waiting for tables. And at the Blue Whale itself, all the seats were filled when I came in at the beginning of the Armen Nalbandian Trio’s first set. During my infrequent visits — maybe three in the past six years? — I’d become accustomed to almost having Weller Court to myself. I was expecting a nearly empty Blue Whale. It was Tuesday night. It was raining. And yet, Little Tokyo was alive and jumping. I wasn’t the only one surprised. Pianist Nalbandian was too, as he happily told the crowd at the end of the first set. It was a pretty live crowd, too. I was in L.A. this past week for a work assignment, and it wasn’t looking like I would have a chance for an evening out, especially with early morning events to attend each day. The quartet Sigmund Fudge — straightahead guitar/keys-led jazz with a touch of attitude — was tempting, but I didn’t have the energy Monday night and already knew I’d be struggling the next morning. But Tuesday at about 8:00 p.m., I found myself with a surprising reserve of energy. Before fatigue could catch up with my body and brain, I headed for Japantown. Nalbandian seemed like a good bet, with a rhythm section of familiar names: Eric Revis on bass and Nasheed Waits on drums. Nalbandian’s music draws from traditional jazz, as you can hear on the solo records on his Blacksmith Brother label, but he’s also a fan of noisy tricks such as playing the inside of the piano. He used the trio format nicely, giving Revis and Waits (and himself) plenty of leash. One number had an extended intro from Waits that you wouldn’t call abstract — but it wasn’t your typical drum solo: clicking and fast, with irregular stresses. Revis, at center stage, was fun to watch, especially during his hard-digging solos. They played a couple of world-premiere tracks including one that I think was called “Nogu,” named after a restaurant. (The crowd got a good laugh out of that. I think we were all expecting a metaphysical Asian backstory.) The set-closer, “Aries,” was a relatively long, episodic piece with lots of high-throttle group improvisation. Nalbandian hangs out in some big circles. His website includes a glowing quote from Matthew Shipp, and he’s recorded with Han Bennik, an improv session that mixes swing with creative mischief. In May, he’s presenting a trio with saxophonist Steve Lehman and drummer Guillermo E. Brown. That will be at E.T.A. in Highland Park, another Los Angeles-area venue. His one album with Revis and Waits is called Quiet As It’s Kept (Blacksmith Brother, 2011), and it features Fender Rhodes rather than acoustic piano, for a sound that’s more quilted but no less high-energy. 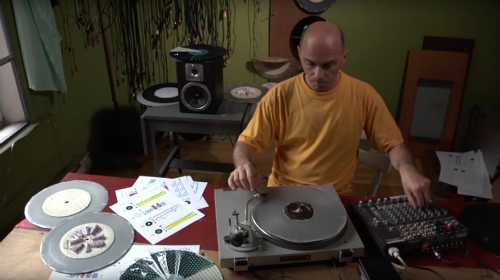 The use of turntables as noise/improv instruments has long fascinated me, mostly in the sense that I wasn’t sure how it was done. My interest got piqued by four CDs released in the span of about one year by Martin Tétreault and Otomo Yoshihide, both “playing” turntables. The discs — Grrr, Tok, Ahhh, and Hmmm — document a European tour in 2003, with each CD meant to reflect a particular mood (the titles are hints). I enjoyed those albums and spent a lot of time wondering how they created all those sounds, and what it really meant to “play” a turntable. Some sounds resembled a characteristic record scratch or the scraping of a finger against the needle. But what were they doing the rest of the time? Only now did it occur to me to go look. In my defense, YouTube’s avant-garde catalog was more sparse a decade ago. But in 2017, a quick search for Tétreault answers my questions right away. My French isn’t good enough to follow along with this interview, but the visuals say it all: He uses discs that are wrapped with different textures, giving him different sounds to play with. He also uses a sound board (as shown in the photo up top), which gives him a few more options. By the way, Yoshihide and Tétreault had an established musical partnership before those 2003 concerts were recorded. Here’s a sample of their work from 1999. And if you want to find out a little more about that four-album set, released on the Ambiances Magnétiques label, you can see a few reviews in Zookeeper, the KZSU music database. ORGANELLE score, by Lisa Mezzacappa, via SFCV. Lisa Mezzacappa’s latest big project, ORGANELLE, has a gig at the Exploratorium in San Francisco on Thursday night, March 9. I wrote a little bit about it last fall, but Jeff Kaliss of San Francisco Classical Voice has done a comprehensive interview with Mezzacappa, going through the details of the score. She discusses which natural processes or phenomena inspired each movement (the longevity of trees, the tiny lifespan of the mayfly) and discusses a new movement, Szygzy, that will feature Wayne Grim, the Exploratorium’s staff artist, who converts celestial data into electronic music. A week later will be the CD release concert for another of Mezzacappa’s projects, avantNOIR. The self-titled album came out on Clean Feed Records in January, and I’ve been listening to it in spurts, mostly in the car or via the laptop. I haven’t given the album a proper, full listen, because I’ve been on the go. I spent most of last week in Barcelona for work (no sightseeing, and only one meal at a restaurant) and spent quite a lot of time chauffeuring kids in the time before and after the trip. One thing I’ve discovered: My primary music-listening medium has been my work laptop. It was just fastest and easiest to collect everything there. That’s a problem, as I’m discovering this morning: The reason for my day off is that I’m between jobs, voluntarily. I handed in that laptop on Monday. I’m already itching to get it back. The music is all here, at home, in CDs and vinyl and hard-drive backups. Some of it is in the cloud, I suppose (that’s unintentional, though, a side effect of today’s music services). But it turns out, I got addicted to the convenience of the laptop. It was always on and often right in front of me. None of that means anything; it’s just interesting. This didn’t happen with my last job transition, which means my music-listening habits have changed radically in just four years. All of my post-Barcelona busy-ness meant I missed a couple of good shows last weekend. Saturday was the Toychestra reunion, as noted here. Sunday night was a prog show including Jack o’ the Clock and Reconnaissance Fly. Jack o’ the Clock doesn’t have another local show planned soon, but they’ll be performing at Seattle’s SeaProg Festival in June, which sounds pretty cool. Reconnaissance Fly’s next gig is in April, at PianoFight (144 Taylor St, San Francisco). 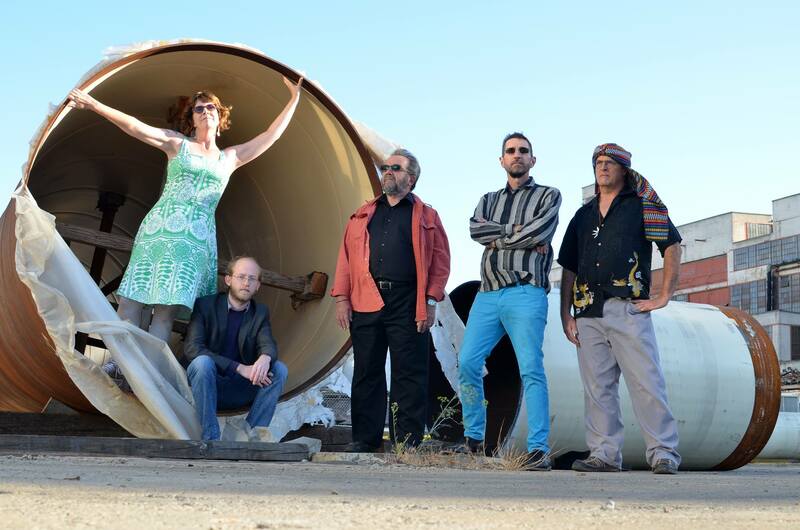 Toychestra is back, about to play a 20th-anniversary show at the Ivy Room (860 San Pablo Ave, Albany) on Saturday, March 4. Does that ever bring back memories. For a couple of years starting in 2002 or 2003, I moonlighted as a music reviewer for the San Francisco Bay Guardian. I had a full-time job but thought it might be fun to write blurbs for the SFBG entertainment calendar in my spare time. That job opening was filled by the time I called, but they did need live-music writers. Do something on spec, and we’ll see what happens, they said. But my best and most satisfying story was Toychestra. “Like Santa’s sleigh crashed into a garage sale” is how I described them, with their grandma’s-attic collection of instruments set on ironing boards, the Christmas lights threaded about the stage, and their crazy kitchy wigs and outfits. 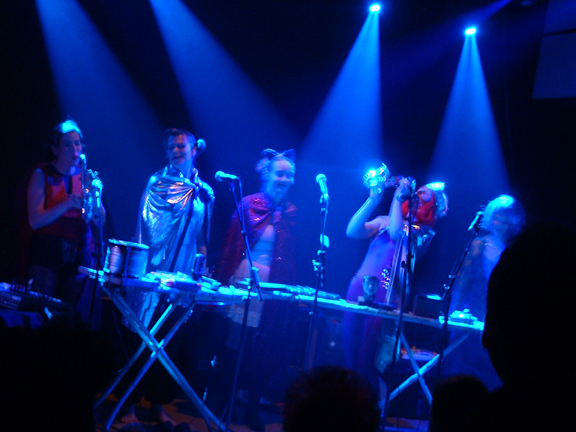 Toychestra was a group of five female artists, mostly non-musicians, hammering out pre-written songs on toy instruments. The music was clanky and innocent but, because it was written without awareness of keys or modes, also bore an uneasy shadow: “It’s Miranda July conducting the Residents in the Twin Peaks Elementary School symphony,” I wrote. Dan Plonsey, who curated the Beanbenders series of shows starting in the mid-’90s, has a taste for the absurd and took a liking to the group. He couldn’t resist pairing them with an improv pro who would appreciate their musical naivite — and thus, Plonsey wrote What Leave Behind, a concerto for Toychestra and guitarist Fred Frith. The sounds are dry and mostly bassless, as you’d expect — these are literally toy instruments. But they’re in tune. Toychestra member Lexa Walsh told me one of their biggest challenges was finding instruments that played a true major scale. Toymakers, realizing most parents had no musical ear, had stopped bothering. With coordinated rhythms and syncopated melodies, What Leave Behind plays out like a sinister circus overture. Frith’s contributions are subtle at first — a buzzing in the opening movement (“The Dub”), a choppy composed melody in the second movement (“Fellini”). He gets to cut loose during “3 Elephants and a Cow,” backed by animal-noise toys. The 24-minute piece ends with the five women singing a ghostly melody. I don’t recall the details, but Toychestra was compelling enough that Summer let me write it as a straight feature rather than a concert review. I did attend one of the live performances of What Leave Behind, at the Starry Plough in Berkeley, and interviewed Walsh afterwards. The resulting story is still viewable on Toychestra’s press page. What Leave Behind, and two other Toychestra albums, are now available on Bandcamp. After Summer Burkes left the Bay Guardian, I was still welcomed as a reviewer but wasn’t nearly as prized. This is normal when a publication changes editors, and I was OK with it. With a toddler and a grade-school kid at home, my showgoing needed to slow down anyway. My final Bay Guardian review must have run at the start of 2006. I had gone dark by then, but one day, Summer’s successor sent a desperation email blast — she needed someone to find a review-worthy show during the week after Christmas. I wrote up the multi-instrumental duo of Chaos Butterfly — experimental stuff that involved Jonathan Segel of Camper Van Beethoven fame, giving my story a connection to mainstream readers. (The other player, Dina Emerson, is no slouch either.) My piece was good, but the experience confirmed that my heart wasn’t in it any more. Mildly Amusing Epilogue: I talked to the Bay Guardian only once more — to the finance department. I was getting paid for my work, but between the day job, the kids, and my KZSU radio gig, I honestly didn’t notice that the checks had never arrived. The light bulb went on a couple of years later, when the IRS asked about a chunk of money that I’d never paid taxes on. Turns out the Bay Guardian had transposed two digits of my home address. We figured this out on the phone within a couple of minutes, and they immediately issued a new check. They were iconoclasts and hellraisers, but the Bay Guardian that I encountered was also quite professional. I have fond memories of my short time with them. For more on Toychestra, check out this edition of KQED’s Spark: http://ww2.kqed.org/spark/toychestra/. For an explanation of the Back Pages series, see here.